See Using images and video in teaching for advice on the use of media. 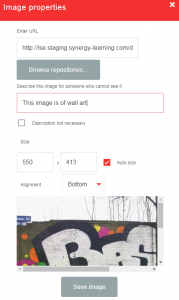 You will normally want the image to appear immediately when the course page opens, so the process for adding it is different to that described in Add a File. Turn editing on and select the topic or section in which you would like the image to appear. Most commonly you will want to add an image to a section summary or to a label within it. You can also add images wherever the editor is available e.g. activity descriptions. Select the configuration icon on a summary or Edit > Edit settings on a label to open the editor. See Add a Label if you need to add a label to hold the image. Expand the toolbar and select the image icon . 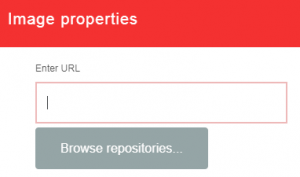 Then Browse repositories to locate the picture. Files you may have previously uploaded (Recent files). N.B. 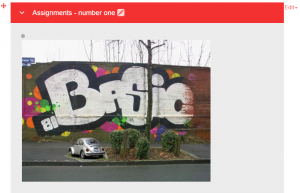 Please ensure that you are not in breach of copyright regulations when adding pictures to Moodle. Flickr Creative Commons is a highly recommended source of pictures which can be used legally and for free. Contact LTI if you want to know of other sources of images. 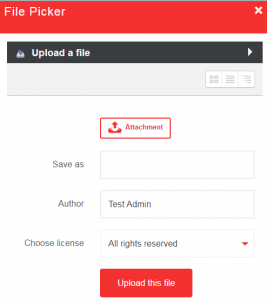 To upload from your computer, make sure File Upload is selected and click Browse. Then follow the prompts to select the image file. Once located, click Open. On the next screen, change the name if needed in Save as, name the Author if it is not you, and choose a license. The sample picture below was found on Flickr Creative Commons with a NonCommercial-ShareAlike license. Click Upload this file. Provide a description for anyone who is using a screen reader or is otherwise unable to view it. Resize if necessary, remembering to maintain proportions using Auto size. (N.B. Preferably images should be uploaded on final size /actual size to be used/. Resizing very large images online will lead to slow loading of pages that is frustrating.) You can also choose a different Alignment if the default Bottom is not suitable. Then Save image. It will then appear in the Editor window. Make sure to add any attribution necessary. Finally, Save changes and it will appear on the page at the chosen location e.g. in a section summary as below. To edit an image after you have added it, click the configuration icon (or Edit settings) and select the picture icon. You can then change the size or alignment, etc.